I do not live in the past, I live in the present, always hoping for a brighter future. This is my message to all my countrymen. 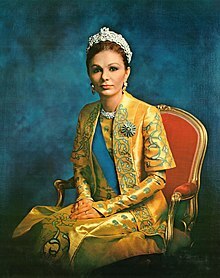 Farah Pahlavi (born 14 October 1938) is the former empress of the Imperial State of Iran, and widow of Muhammad Reza Pahlavi. Interview: Farah Pahlavi Recalls 30 Years In Exile, Radio Free Europe, (July 27, 2010). I think, as a politician, [the exiled shah] had realized that the leaders were after their own political interests and they would very much like to establish relations with the [upcoming] regime in the country. But their inhuman behavior was terrifying, along with all the lies that the media would publish. I used to wonder for years, all those who wrote on the [subject] of human rights back then, how did they remain silent after all the inhuman incidents in Iran during the later years? 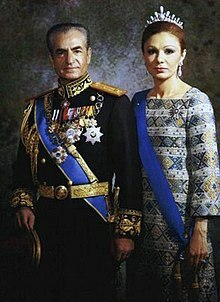 [It was no] coincidence [that] the downfall of the shah [led to an Iran in which] the Iranians no longer had any human rights. [Sheltering the shah and his family] was completely out of [President Sadat's] friendship and good human nature as he had no personal gain from it. Egyptians had not forgotten the help they received from Iran during their troubled times of war. I have always been fascinated with the arts. When I was in Iran in that position I was constantly concerned with promoting our Iranian traditional art but, at the same time, with introducing contemporary and modern art. Former queen of Iran on assembling Tehran's art collection, The Guardian, (August 1, 2012). I found the king extremely attractive, naturally endowed as he was with all the intellectual qualities a woman could wish for in the man close to her heart. I never thought that a person's worth came from birth or wealth, and much later when I was queen, and then in exile, I had ample proof of it. I found the king extremely attractive, naturally endowed as he was with all the intellectual qualities a woman could wish for in the man close to her heart. His gentle, serious look, which could still be indulgent and warm, and his lovely smile touched me deeply. And there were other details I liked: the way he held his head, his long eyelashes, which I found unutterably romantic, his hands. Yes, I was secretly won over, charmed by him. The king was not marrying a princess; he was not giving in to the convention of arranged marriages between families of royal blood. No, he had fallen in love with a "little Iranian girl" and, as in fairy tails, he was going to follow his heart. [The king] would assure me, a long time later, that he had said "I love you" to only three women. "One of them is you," he told me. The people of Tehran, from whom I came, were giving me their trust, adopting me, honoring me, although I had done nothing yet either for them or for Iran. I felt so moved and overcome that I promised myself I would do everything in mypower for these men and women, and for the children I could see perched everywhere. I came and knelt at the king's feet, and when he put the crown on my head, I felt that he had just honoured all the women of Iran. Only four years earlier we had been in the same category of the mentally handicapped: we did not even have the basic right of choosing our representatives. The crown wiped out centuries of humiliation; more surely than any law, it solemnly affirmed the equality of men and women. She is still an exemplary supportive mother, and an affectionate grandmother who also occupies herself by continuing her support of charities that are at work in Iran. Reza Pahlavi, as quoted by Christoph Lehermayr, Der Sohn des Schahs spricht exklusiv mit NEWS.at: "Ich bin bereit, Konig zu werden", NEWS.at, September 15, 2009. As queen, Farah achieved almost immediate popularity. She had several features that pleased the Iranians: she was 'fully Iranian' and also worthy of honour because she descended from the family of the Prophet. She was a brunette with deep black eyes of the kind most Persians cherish. (The Shah's outlandish taste for blondes was not shared by his compatriots.) 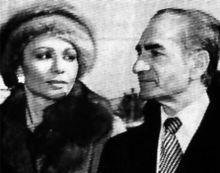 Farah appeared to be slightly taller than the Shah, but this could not be held against her. The new queen's athletic physique and her well-publicised love of sports disconcerted some religious circles, but even the more conservative Iranians now understood that times were changing. This page was last edited on 6 March 2018, at 00:11.